Set in 'Lord of the Rings' territory, Eco Seagate forces the company's techies to get out of their comfort zones. Eco Seagate's 17-hour days begin with yoga and are packed with empowering activities. At the starting line after a week of grueling training. 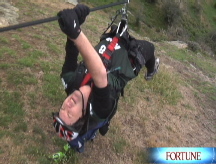 Seagate CEO Bill Watkins puts his employees through a 40-K adventure race to create conflict. (Fortune Magazine) -- "Everyone here's going to die." Some 200 Seagate Technology employees have spent the past several months preparing for this week. They've been riding bikes through the streets of Malaysia and Thailand, hiking the hills of Northern Ireland and Hong Kong, running in Silicon Valley and Colorado. They've flown a dozen hours or more from around the globe, taken a gondola ride up the face of a cliff, and gathered in a restaurant overlooking Lake Wakatipu. One has lost 40 pounds on the road to Queenstown, New Zealand. Others have curbed their drinking and smoking. When their leader, Bill Watkins, took the stage a moment ago on this cool Sunday evening, the place was buzzing with rumors. Many of these Seagaters -Type-A engineers, hyper-educated Ph.D.s, brilliant MBAs - are accustomed to being the smartest, most confident people in any room they walk into. But tonight they're jittery. It was bad enough knowing that in a few short days they'll compete in a 40-kilometer adventure race through the heart of Middle-earth. Now the CEO just told them that they're all gonna die. And he wasn't smiling when he said it. It's what Watkins, 53, says at the start of every Eco Seagate, the annual $2 million mother of all team-building events held at the bottom of the world. That's a lot to spend on what looks like a boondoggle. What does running around the southern Alps have to do with engineering? Nothing, actually, and that's the point. The glaciers of New Zealand's South Island form an environment completely unfamiliar to the average tech worker. It's expansive, glorious, and awe-inspiring, but it's also uncertain and intimidating, making everyone feel off balance. Of course Watkins isn't trying to kill his charges. But he is making them uncomfortable as a way to open their minds. He thinks Eco week, which Seagate has been holding since 2000, helps build a more collaborative, team-oriented company. He also thinks it teaches his people something about priorities. Yes, everyone in this room will die - at some point. But before then they'll face important choices about where to work, what to believe in. Choices, really, about change and ultimately happiness. "Are you doing what you want to do in your life? Or are you just blowing through?" Watkins continues. "I'm challenging your life right now. What would you do if you knew you couldn't fail? Would you take a trip around the world? Run a company? If you're not doing what you want, that's where I want you to go. This week is about you doing what you want to do for every week of the rest of your life." It's a curious way for a CEO to start a pep rally. Surely people in this room have regrets, daydreams, and ambivalence about their day jobs. We all do. But by the yardstick of a typical CEO, Watkins is one curious dude. If he weren't, there'd be no Eco Seagate. Which would mean that come Friday, there'd be no 17-kilometer trek through the bog, no 18-kilometer bike ride over treacherous mountain terrain, no punishing five-kilometer slog on kayaks into stiff headwinds, no dangling from cables over gorges, no otherworldly vistas, no face-plants into cold gray rivers, no electrocutions on live-wire fences or twisted knees or swollen ankles or pulled hamstrings. There'd probably be no hugging. And almost certainly there would be no crying. TRUST - Monday, 5:55 A.M.
Aside from the executives, who return every February, most participants are here because they nominated themselves. Of 55,000 Seagate employees worldwide, more than 2,000 volunteered this year. Some were picked on their first try. Others have been hoping for nearly a decade. A few months ago we were split into 40 teams of four men and a woman. Some employees were paired with exemplary colleagues, for the sake of an attitude adjustment. "People should not think of Eco Seagate as a reward," one event organizer says. "This is about behavior modification." All teams are more or less equal physically. Each has a weakness that may not be apparent. My team, The Good, the Bad, and the Five of Us (GB5), consists of Joseph Wong, a 35-year-old salesman from Hong Kong who is both charming and seriously lacking in self-confidence; Wee Chuan Loh, a 33-year-old Malaysian engineer whose emotions bunch up around his eyes; Regan MacPherson, our female team member, a 44-year-old aggressively positive attorney from Scotts Valley, Calif.; Andy Davis, a 44-year-old VP in Longmont, Colo., who's fond of high-fives and snap decisions; and me, a 38-year-old perpetually tardy San Franciscan generally inclined to go it alone. Our weakness: We're worthless when reading a map - but we don't know that yet. We are also members of the Ruru tribe. Last night the 40 teams were arranged into four tribes named for New Zealand birds: Kia, Ruru, Tui, and Weka. Come race day, each member of the winning tribe will receive a large jade trophy and serious bragging rights. Within minutes of receiving our tribe designation, we had religion and began chanting. "Ruru!" Fists on tables. "Ruru!" Hands in the air. "Ruru!" Being CEO of a global tech company circa 2008 comes with certain strategic and tactical challenges: unifying a workforce across languages and cultural divides, staying ahead of the technological curve, increasing yields, boosting a flagging stock price. But Watkins says that any CEO feels one pressure above all others: the pressure to grow. "I started out doing startups. I went through four IPOs," he says during one of a series of interviews over several months. "I loved that everyone did everything. There are no titles. You work together, treat each other like human beings, and there's great camaraderie. As companies grow, you create silos and you become titles. So I'd quit and go back to a startup. I finally got convinced to stay and try to manage people." Watkins came to Seagate through the acquisition of Conner Peripherals in 1996. He rose to president in 2000, playing a key role in both the $20 billion deal to privatize the company that year and the IPO two years later. By 2004 he would be named chief executive. But the early days were tough. "They called it Slavegate. People got fired all the time," he says. "The CEO had a grenade on his desk." Despite that grenade, Watkins's boss knew that Seagate's culture was warped, and he wanted a new one. So Watkins set out to create a new vibe, to make the company to feel small again. He read up on behavioral psychology and found this insight: The key to modifying behavior is creating an environment where we can't rely on experience. In unfamiliar situations, people - especially when tired - are more apt to ask for help and work as a team. If he could show his people the value of teamwork outside the office, Watkins reasoned, they'd translate the experience back at Seagate.